Soviet methods of quality control and financial accountability for failures would help Russia’s space industry according Dmitry Medvedev. Roscosmos believes the solution is to increase the number of managers. The latest meeting between Prime Minister Dmitry Medvedev, top Russian Space Agency (Roscosmos) officials and directors of major Russian space enterprises focussed on the turnaround of the Russian space industry. The meeting comes in the wake of a series of high-profile accidents in 2011-2012 that made it clear that the industry was on the brink of a systemic crisis. Possible personnel and management changes in the industry was on the meeting’s agenda. 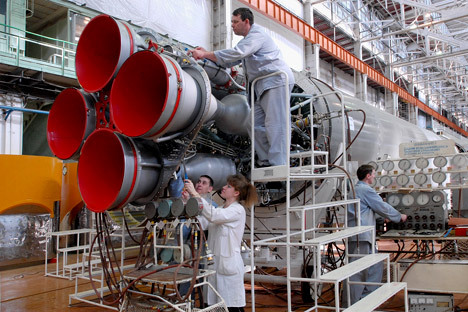 Disarray in the Russian space industry has already cost several heads of defence and space-sector employees their jobs. At the meeting, Prime Minister Dmitry Medvedev proposed several ways to rescue the industry, one of which involves improving the quality of products through stricter discipline. “It’s not that we don’t know what discipline is – we had it in Soviet times, and we should have it today,” Medvedev said. He suggested that Roscosmos groups, as single legal entities, should be financially liable for failures within the industry. In other words, liability falls not only on the management but the entire organisation. “We are talking about the financial liability of a legal entity for inadequate quality of products and services,” the Russian prime minister said. Head of Roscosmos, Vladimir Popovkin, on his part, noted that his agency had a staff of only 200, which is not enough to run the industry. Medvedev responded by asking whether doubling the staff would help eliminate quality-control issues: Popovkin assured him that it would. In fact, it was the head of Roscosmos who had stressed earlier that the agency was short of qualified managers. The Russian space industry suffered a major setback on August 6, when the Russian communications satellite Express-MD2 and Indonesia’s Telkom 3 were lost because of a malfunction of the Khrunichev Space Centre’s booster rocket. The loss of these probes was the latest in a string of failures for the Russian space industry that began in 2011. Two of the five accidents last year were due to faults in equipment developed at Khrunichev. Roscosmos reacted to the series of accidents by proposing a sweeping reform of the industry. Under its plan, the space industry would have seven integrated organisations, instead of the 15 that currently exist. Designers of the plan hope that the reform will eliminate development and production redundancies within the industry and increase the load on enterprises, which currently operate at only 35 percent of their capacity. The former head of Roscosmos, Anatoly Perminov, planned a similar reorganisation of the space industry. He also tried to create holding companies, but without a clear division of their functions, which led to labour inefficiencies. For example, two similar rockets, the Angara and Rus-M, were being developed simultaneously by the Khrunichev Space Centre and S. P. Korolev RSC Energia respectively, which increased costs within the industry. Experts admit that the success or failure of the proposed reform will determine whether Roscosmos is able to keep its promises to the Prime Minister. Late last April, Roscosmos submitted its “Strategy for the Development of Space Activities through 2030” to the government. The document is replete with bold plans to build diverse manned and unmanned spacecraft. It calls for the development of all kinds of new technologies and to expand a range of space services, including sending manned flights to the moon. Roscosmos would also like to deploy stations on Mars and explore Venus and Jupiter. By 2030, the plan expects Russian spacecraft to be able to meet 95 percent of social, economic, science and defence requirements, compared with 40 percent in 2011. The Mars station is a long shot. In the meantime Roscosmos, clearly fearing a repeat of the Phobos-Grunt probe accident, has decided to shut down 15 programmes aimed at exploring the planets of the solar system. Instead, Roscosmos plans to establish a multi-purpose space system named Arktika, under which several satellites will be launched to continuously monitor Arctic territories. One of the space industry’s main problems is financing. A third of the industry’s enterprises are practically bankrupt. Compared to developed countries, Russia invests ten times less in research and development in the industry, and five times less in basic assets and personnel training. “More than 70 percent of technologies that meet production needs are worn out and outdated. More than half of the machine tools are past their service lifespan. The average age of employees is 50, and at defence industry research institutes it is almost 60,” said retired Major General Vladimir Dvorkin, who was formerly the head of a Ministry of Defence research institute engaged in developing programmes to upgrade Strategic Nuclear Forces. Russia needs to make more of an effort on the technological front by launching a modest probe towards the moon. And, on the political front, it could try developing a private space-exploration programme based on the American model. Either way, if the Russian industry continues to inflate managerial staff, lure space tourists and try to impress the world with extraordinary space programmes, then it will fall hopelessly behind – no matter how many meetings are held.